A college football national championship in the highest level of play in the United States, currently the NCAA Division I Football Bowl Subdivision (FBS), is a designation awarded annually by various organizations to their selection of the best college football team. Division I FBS football is the only National Collegiate Athletic Association (NCAA) sport for which the NCAA does not sanction a yearly championship event. As such, it is sometimes unofficially referred to as a "mythical national championship". Due to the lack of an official NCAA title, determining the nation's top college football team has often engendered controversy. A championship team is independently declared by multiple individuals and organizations, often referred to as "selectors". :107–109 These choices are not always unanimous. While the NCAA has never officially endorsed a championship team, it has documented the choices of some selectors in its official NCAA Football Bowl Subdivision Records publication. :107–119 In addition, various analysts have independently published their own choices for each season. These opinions can often diverge with others as well as individual schools' claims to national titles, which may or may not correlate to the selections published elsewhere. Currently, two widely recognized national champion selectors are the Associated Press, which conducts a poll of sportswriters, and the Coaches' Poll, a survey of active members of the American Football Coaches Association. Since 1992, various consortia of major bowl games have aimed to invite the top two teams at the end of the regular season (as determined by internal rankings, or aggregates of the major polls and other statistics) to invite in a de facto national championship game. The current iteration of this practice, the College Football Playoff, selects four teams to participate in national semi-finals hosted by two of six partner bowl games, with their winners advancing to the College Football Playoff National Championship. A number of other mathematical systems were born in the 1920s and 1930s and were the only organized methods selecting national champions until the Associated Press began polling sportswriters in 1936 to obtain rankings. Alan J. Gould, the creator of the AP Poll, named Minnesota, Princeton, and SMU tri-champions in 1935, and polled writers the following year, which resulted in a national championship for Minnesota. The AP's main competition, United Press, created the first poll of coaches in 1950. For that year and the next three, the AP and UP agreed on the national champion. The first "split" championship occurred in 1954, when the writers selected Ohio State and the coaches chose UCLA. The two polls also disagreed in 1957, 1965, 1970, 1973, 1974, 1978, 1990, 1991, 1997, and 2003. The Coaches' Poll would stay with United Press (UP) when they merged with International News Service (INS) to form United Press International (UPI) but was acquired by USA Today and CNN in 1991. The poll was in the hands of ESPN from 1997 to 2005 before moving to sole ownership by USA Today. Beginning in 2014, Amway became a joint sponsor with USA Today. Though some of the math systems selected champions after the bowl games, both of the major polls released their rankings after the end of the regular season until the AP polled writers after the bowls in 1965, resulting in what was perceived at the time as a better championship selection (Alabama) than UPI's (Michigan State). After 1965, the AP again voted before the bowls for two years, before permanently returning to a post-bowl vote in 1968. The coaches did not conduct a vote after the bowls until 1974, in the wake of awarding their 1973 championship to Alabama, who lost to the AP champion, undefeated Notre Dame, in the Sugar Bowl. The AP and Coaches' polls remain the major rankings to this day. The Bowl Championship Series, famous for its use of math, was the successor of the Bowl Alliance (1995–1997), which was itself the successor of the Bowl Coalition (1992–1994). Besides the many adjustments it underwent during its tenure, including a large overhaul following the 2004 season that included the replacement of the AP Poll with the Harris poll, the BCS remained a mixture of math and human polls since its inception in 1998, with the goal of matching the best two teams in the nation in a national championship bowl game which rotated yearly between the Sugar, Fiesta, Rose, and Orange from 1998 to 2005, and later a standalone game titled the BCS National Championship Game (2006 to 2013). The winner of the BCS Championship Game was awarded the national championship of the Coaches' Poll thus winning the AFCA National Championship Trophy. The BCS winner also received the MacArthur Trophy from the National Football Foundation. Neither the AP Poll, nor other current selectors, had contractual obligations to select the BCS champion as their national champion. The BCS resulted in a number of controversies, most notably after the 2003 season, when the BCS championship game did not include eventual AP champion USC, the only time the two championships have diverged since the advent of the BCS. After many seasons of controversy, the BCS was replaced with the College Football Playoff, a Plus-One system aimed at reducing the controversy involved in which teams get to play in a championship game through use of a playoff. *The BCS used a mathematical system that combined polls (Coaches' and Harris) and multiple computer rankings (including some individual selectors listed above) to determine a season ending matchup between its top two ranked teams in the BCS Championship Game. The champion of that game was contractually awarded the Coaches' Poll and National Football Foundation championships. The poll has been the dominant national champion selector since the inception of the AP Poll in 1936. It is notable that the NFF merged with UPI from 1991 to 1992 and USA Today from 1993 to 1994. Selectors are listed below with years selected retroactively in italics. During the BCS era, the winner of the BCS Championship Game was automatically awarded the national championship of the Coaches' Poll and the National Football Foundation. bServed as the Coaches' Poll during the designated years. The 2004 AFCA National Championship awarded to USC in conjunction with the BCS was vacated by the BCS and the AFCA Coaches' Trophy was returned. cThe UPI Poll conducted the Coaches' Poll through the 1990 season, which was subsequently taken over by the CNN/USAToday. UPI then conducted a poll of National Football Foundation members in 1991 and 1992, the winner of which was designated by the NFF as its national champion and received the MacArthur Trophy. dUSAT/CNN conducted its own poll of college football sportswriters until it took over the Coaches' Poll starting with the 1991 season. eUSA Today took over the poll of the National Football Foundation's members in 1993 from the UPI, and its winner was designated by the NFF as its national champion and received the MacArthur Trophy. The poll was conducted by USA Today through the 1996 season, although national championship selections in the NCAA Football Bowl Subdivision Records do not distinguish the NFF from the USAT/NFF poll in 1995 and 1996. USA Today conducted this poll separately from the CNN/USAToday Coaches' Poll, and the two should not be confused. College football historian Parke H. Davis is the only selector considered by the NCAA to have primarily used research in his selections. :107–109 Davis did all of his work in 1933, naming retroactive national champions for most of the years from 1869 to 1932 and naming Michigan and Princeton (his alma mater) co-champions at the end of the 1933 season. Unlike all selectors prior to 2014, the College Football Playoff does not use math, polls or research to select the participants. Rather, a 13-member committee selects and seeds the teams. The playoff system marked the first time the top-level NCAA football championship was determined by a bracket competition. Note that the Harris Interactive Poll (2005–2013) was contracted by the BCS to help formulate its standings, and although its final ranking which occurs prior to the bowl games is listed in the official NCAA Football Bowl Subdivision Records, it does not conduct a final poll or award or name a national champion on its own and so has been eliminated from the following table. Teams listed in italics indicate retroactive-applied championships. Teams listed in bold reflect the NCAA's designation as "Consensus National Champions" by virtue of their selection from 1950 onward by one or more selectors from Associated Press, UPI, Football Writers Association of America, NFF/College Football Hall of Fame, and USA Today. A letter next to any season, team, record, coach or selector indicates a footnote that appears at the bottom of the chart/table. For example, the 2004 champion (USC) has a footnote (b), leading to explanatory information at the bottom. cThe FWAA stripped USC of its 2004 Grantland Rice Trophy and vacated the selection of its national champion for 2004. The BCS also vacated USC's participation in the 2005 Orange Bowl and vacated USC's 2004 BCS National Championship and the AFCA Coaches' Poll Trophy was returned. dRecord reflects vacated wins against UCLA and against Oklahoma in the BCS Championship game on January 4, 2005 as mandated by the NCAA. cIowa lists the awarding of the 1958 Grantland Rice National Championship in various publications, but describes championship selections from 3 other years as well in its annual media guide. dAuburn's 1913, 1983, and 1993 (Auburn was disqualified from post-season play in 1993 and did not play in a bowl game) championships are not recognized by the school. College Football Data Warehouse (CFBDW) is an online resource and database that has collected and researched information on college football and national championship selections. It provides a comprehensive list of national championship selectors and has itself recognized selectors that it has deemed to be the most acceptable throughout history. These include the National Championship Foundation (1869–1882), the Helms Athletic Foundation (1883–1935), the College Football Researchers Association (1919–1935), the Associated Press Poll (1936–present), and the Coaches Poll (1950–present). From its research, it has compiled a list of Recognized National Championships for each season. Some years include recognition of multiple teams for a particular season. Please note that the CFBDW list of Recognized Champions does not confer any additional legitimacy to the titles. In this regard, some universities claim championships not recognized by CFBDW or do not claim championships that are recognized by CFBDW. Please consult the above table of National championship claims by school or individual team articles and websites for possible additional or alternative national championship claims. Below is a list of all of the CFBDW recognized national championships from 1869 to present. The polling system first gained widespread consistency with the introduction of the AP poll in 1936, followed by the Coaches' Poll in 1950. National championships are often popularly considered to be "consensus" when both of these polls are in agreement with their national championship selections, although other selectors exist and do make alternative selections. A more modern incarnation, the Bowl Championship Series (BCS), was a consortium of college football conferences that uses a combination of various computer rankings and human polls to mathematically determine a post-season matchup between the two top teams as determined by its formula. The USA Today Coaches' Poll was contractually obligated to name the BCS champion as its national champion. Beginning in the 1968 season, a post bowl game poll was released and the AP championship reflected the bowl game results. The UPI did not follow suit with the coaches' poll until the 1974 season. The Coaches' poll began selecting the top 20 teams on a weekly basis during the 1950–1951 college football season. It is conducted among selected members of the American Football Coaches Association. In 1990 the poll expanded to a top 25, and it has retained this format since. The Coaches' Poll took their final poll prior to the bowl games from 1950–1973, and since 1974, has taken their final poll after bowl games. The Coaches' Poll does not include teams on either NCAA or conference-sanction probation, which also differentiates it from the AP poll. The poll has been released through various media outlets and with differing sponsors over its history, and thus has taken a succession of different names, including United Press (UP) from 1950 thru 1957, the United Press International (UPI) from 1958 thru 1990, USA Today/CNN from 1991 thru 1996, USA Today/ESPN from 1997 to 2004, and USA Today from 2005 to present. During the era of the BCS, the Coaches' Poll was under contractual obligation to award its national championship selection to the winner of the BCS Championship Game or its predecessors—who was presented with the AFCA National Championship Trophy during a post-game presentation. The College Football Playoff is not tied to the Coaches' Poll in this manner. The following table contains the National Championships that have been recognized by the final AP or Coaches' Poll. Originally both the AP and Coaches' poll champions were crowned after the regular season, but since 1968 and 1974, respectively, both polls crown their champions after the bowl games are completed. The BCS champion was automatically awarded the Coaches' Poll championship. Of the current 120+ Football Bowl Subdivision (FBS, formerly Division I-A) schools, only 30 have won at least a share of a national title by the AP or Coaches' poll. Of these 30 teams, only 19 teams have won multiple titles. Of the 19 teams, only 7 have won five or more national titles: Alabama, Notre Dame, Oklahoma, USC, Miami (FL), Nebraska, and Ohio State. The years listed in the table below indicate a national championship selection by the AP or Coaches' Poll. The selections are noted with (AP) or (Coaches) when a national champion selection differed between the two polls for that particular season, which has occurred in twelve different seasons (including 2004, for which the coaches selection was rescinded) since the polls first came to coexist in 1950. *USC's 2004–2005 BCS National Championship was vacated by the BCS and the AFCA Coaches' Trophy returned. The Bowl Championship Series (BCS) was a selection system designed to give the top two teams in the NCAA Division I-Football Bowl Subdivision System (formerly Division I-A) an opportunity to compete in a "national championship game". This championship was intended as a surrogate for a playoff system since the NCAA does not formally determine a champion in this category. It began during the 1998 season, but a number of controversial selections spurred changes to the format over the years. Prior to the 2006 season, eight teams competed in four BCS Bowls (the Orange, Sugar, Rose, and Fiesta). The BCS replaced the Bowl Alliance (in place from 1995–1997), which itself followed the Bowl Coalition (in place from 1992–1994). One of the main differences was that the Rose Bowl participated in the BCS; previously, the Big Ten and Pac-12 champions automatically played in the Rose Bowl regardless of their poll rankings. However, after the change, those teams played in the BCS National Championship Game if they finished No. 1 or No. 2 in the BCS standings. The BCS formula varied over the years, with the final version relying on a combination of the Coaches' and Harris polls and an average of various computer rankings to determine relative team rankings, and to narrow the field to two teams to play in the BCS National Championship Game held after the other college bowl games. The winner of this game was crowned Coaches' Poll national champion winning the AFCA National Championship Trophy and was also awarded the MacArthur Trophy by the National Football Foundation. *USC's victory in the 2005 Orange Bowl and subsequent 2004–05 BCS National Championship was vacated by the BCS. ↑ The following schools either make no apparent statement or claim regarding national championships, or clearly state no claims on a national championship, despite the listing of a national championship for that school in the official NCAA Football Bowl Subdivision Records: Arizona State, Centre, Colgate, Columbia, Detroit, Missouri, Purdue, Rutgers, Washington & Jefferson, and Wisconsin. ↑ All National Championships listed in the official NCAA Football Bowl Subdivision Records, as well as all additional selections compiled at College Football Data Warehouse, were checked for claims by the applicable schools. Although every care was taken to be thorough and accurate, it can not be assumed that there are no missing or misrepresented claims due to potential limitations of the available source material for any one institution. ↑ "Syracuse and Cornell Still Top Gridders". The Reading Eagle. Reading, PA. November 12, 1923. p. 12. Retrieved May 5, 2015. ↑ Viehman, Harold H., ed. (1939). The 1939 Owl. Pittsburgh, PA: University of Pittsburgh. p. 276. Retrieved May 5, 2015. ↑ Dodd, Dennis (December 22, 2004). "Subtracting AP poll leaves BCS again scrambling for legitimacy". CBSsports.com. Archived from the original on March 8, 2013. Retrieved May 5, 2015. ↑ Peterson, Bill (November 5, 2008). "UC Football in the Hunt for a Big East Crown and BCS Bid". Citybeat.com. Retrieved May 5, 2015. 1 2 3 Hooper, Matt (October 10, 2009). Noel, Tex, ed. "How many national titles can Alabama really lay claim to? Better yet, why is there more than one answer? (republished with permission from the Birmingham Weekly)" (PDF). The College Football Historian. Intercollegiate Football Researchers Association. 2 (9). ISSN 2326-3628. Retrieved May 5, 2015. 1 2 3 4 5 6 7 8 9 10 11 12 13 14 15 2016 NCAA Football Bowl Subdivision Records (PDF). Indianapolis, IN: The National Collegiate Athletic Association. August 2016. Retrieved August 24, 2016. 1 2 3 DeLassus, David. "National Championships". College Football Data Warehouse. Retrieved May 5, 2015. ↑ "Doctors After the Indians". Baltimore American. 187 (34,129). Baltimore, MD. October 31, 1899. p. 4. Retrieved May 5, 2015. 1 2 Noel, Tex, ed. (May 2009). "Three Actual Polls from the 1901 College Football Season" (PDF). The College Football Historian. Intercollegiate Football Researchers Association. 2 (4). ISSN 2326-3628. Retrieved May 5, 2015. 1 2 3 4 5 6 Walsh, Christopher J. (2007). Who's #1? : 100-Plus Years of Controversial National Champions in College Football. Taylor Trade Publications. pp. 13–16, 148–149. ISBN 9781461734765. Retrieved May 5, 2015. ↑ "Year-by-Year FBS Coaches Final Polls". AFCA.com. American Football Coaches Association. Retrieved May 5, 2015. ↑ Billingsley, Richard (2001). "The road to the BCS has been a long one". ESPN College Football. ESPN. Retrieved May 7, 2015. 1 2 "The MacArthur Bowl". National Football Foundation. Retrieved May 5, 2015. ↑ Wieberg, Steve. "New Harris poll to replace AP in BCS formula". USA Today Sports. USA Today. Retrieved May 5, 2015. ↑ "AFCA Recognizes Oklahoma State as 1945 National Champion". afca.com. American Football Coaches Association. Retrieved 18 October 2016. 1 2 3 4 "BCS strips Southern California of 2004 national championship". USA Today. June 6, 2011. Retrieved May 5, 2015. ↑ Whitley, David (9 February 2013). "College football playoff selection committee members will need witness protection". AOL SportingNews.com. Retrieved May 5, 2015. ↑ "Bowl Championship Series". Harris Interactive News Room. Harris Interactive. Retrieved May 5, 2015. ↑ Okeson, Walter R., ed. (1935). Spalding's Official Foot Ball Guide 1935. New York: American Sports Publishing Co.
↑ Sagarin, Jeff. "FINAL COLLEGE FOOTBALL 1998 Ratings thru results of MONDAY, JANUARY 3, 1999". USA Today. Retrieved May 5, 2015. ↑ "USC loses Grantland Rice Trophy". ESPN.com news services. ESPN. Retrieved May 5, 2015. ↑ "BCS Group vacates USC 2004-05 national championship following NCAA denial of appeal". bcsfootball.org. Bowl Championship Series. Retrieved May 5, 2015. ↑ "University of Southern California Public Interactions Report" (PDF). USA Today. NCAA. Retrieved May 5, 2015. ↑ Dunkel, Bob. "Final 2007: Trojans Finish Ranked No. 1". NCAA Football Division 1-A Rankings. The Dunkel Index. Retrieved May 5, 2015. 1 2 DeLassus, David. "Recognized National Championships by Year". College Football Data Warehouse. Retrieved May 5, 2015. 1 2 DeLassus, David. "Current National Championship Selectors". College Football Data Warehouse. Retrieved May 5, 2015. 1 2 DeLassus, David. "Previous National Championship Selectors". College Football Data Warehouse. Retrieved May 5, 2015. ↑ "Princeton Football National Championships". Go Princeton Tigers. Princeton University. Retrieved May 5, 2015. ↑ Conn, Steve (2009). 2009 Yale Football Media Guide (PDF). Yale University. pp. 106–112. Retrieved May 5, 2015. ↑ "Yale Official Athletic Site – Football by Year". Retrieved May 5, 2015. ↑ Purinton, Jeff; Maxon, Josh; Walker, Doug; Paré, Jessica; Thompson, Alex (2011). 2015 Alabama Football Spring Media Guide. University of Alabama. p. 3. Retrieved May 5, 2015. ↑ Eisendrath, Zach; Satterfield, Derek, eds. (2014). 2014 University of Michigan Football Media Guide (PDF). University of Michigan. pp. 2,183. Retrieved May 5, 2015. ↑ Bertsch, Michael; Masters, Chris; Torbin, Leigh (2014). Notre Dame Football 2014 Media Guide. University of Notre Dame. pp. 2,157. Retrieved May 5, 2015. ↑ USC Sports Information Office (2014). 2014 USC Football Media Guide (PDF). University of Southern California. p. 114. Retrieved May 5, 2015. ↑ Borghetti, E.J. ; Feeley, Ted; Welsh, Celeste; et al., eds. (2014). 2014 Pitt Football Media Guide (PDF). Pittsburgh, PA: University of Pittsburgh. p. 130. Retrieved May 5, 2015. ↑ 2014 Ohio State Football Media Guide (PDF). The Ohio State University Department of Athletics. 2014. pp. 1, 4. Retrieved May 5, 2015. ↑ "Ohio State Buckeyes - 2014 NCAA Football Champions". Ohio State Buckeyes. CBSi Advanced Media. Retrieved May 5, 2015. ↑ "Media Center: Harvard Crimson Football - National Championships". Official Website of Harvard Athletics. Harvard University. Retrieved May 5, 2015. ↑ "GopherSports.com: University of Minnesota Athletics – National Champions". University of Minnesota Athletics Department. Retrieved May 5, 2015. ↑ "OU History & Tradition - 7 National Championships". SoonerSports.com. University of Oklahoma Department of Intercollegiate Athletics. Retrieved May 5, 2015. ↑ Dolan, Eric (August 1, 2014). 2014 Penn Football Fact Book (PDF). University of Pennsylvania Office of Athletic Communications. pp. 6, 78–79. Retrieved May 5, 2015. ↑ Lewandowski, John; Phlegar, Ben (2014). Michigan State 2014 Football Media Guide. Michigan State University Sports Information Department. p. 5. Retrieved May 5, 2015. ↑ Stanton, Jimmy; Yellin, Jason; Kniffen, Mary-Carter, eds. (2014). 2014 Tennessee Football Media Guide. University of Tennessee Department of Athletics. pp. 1, 160–174. Retrieved May 5, 2015. 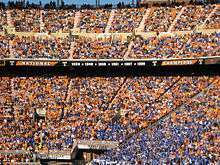 ↑ "Tennessee Official Athletic Site – Football: National Champions". University of Tennessee Department of Athletics. Retrieved May 5, 2015. ↑ Benenson, Herb, ed. (2014). 2014 California Golden Bears Football Information Guide (PDF). Cal Media Relations Office. p. 146. Retrieved May 5, 2015. ↑ Over a Century of Tradition (PDF). Cornell Athletics Communications Office. 2015. p. 3. Retrieved May 5, 2015. 1 2 3 2014 Georgia Football Media Guide. University of Georgia Athletics Department. 2014. pp. 159–161, 190. Retrieved May 5, 2015. ↑ Brown, Kent, ed. (2014). 2014 Illinois Football Record Book (PDF). University of Illinois Division of Intercollegiate Athletics. p. 114. Retrieved May 5, 2015. ↑ "Hurricanes Football History & Records". University of Miami Athletics. Retrieved May 5, 2015. ↑ "Huskers.com-Nebraska Athletics Official Web Site: Nebraska's Five National Titles". University of Nebraska Athletic Department. Retrieved May 5, 2015. ↑ "Georgia Tech Official Athletic Site – Football: Titles Won". Georgia Tech Athletic Department. Retrieved May 5, 2015. ↑ Roe, Steve; Wagner, Traci; Walenta, Theresa, eds. (2014). 2014 Iowa Football Media Guide (PDF). University of Iowa Athletic Department. p. 104. Retrieved May 5, 2015. ↑ Bianco, John (2014). 2014 Texas Football AdvoCare V100 Texas Bowl Guide (PDF). University of Texas at Austin. p. 120. Retrieved May 5, 2015. ↑ 2016 Husky Football Guide (PDF). University of Washington Athletic Communications Office. 2016. p. 84. Retrieved October 28, 2015. ↑ Faulkner, Matt, ed. (2014). 2014 Army Football Media Guide. U.S. Military Academy Office of Athletic Communications. p. 126. Retrieved May 5, 2015. ↑ "GatorZone.com: Gator Football History". University Athletic Association. Retrieved May 5, 2015. ↑ Stipe, Zach; Lonzo, Kerwin, eds. (2014). 2014 FSU Football Media Guide (PDF). Florida State University Department of Athletics. pp. 126–128. Retrieved May 5, 2015. ↑ LaBella, Phil (2014). 2014 Lafayette Football Media Guide (PDF). Lafayette Athletics Communications. p. 6. Retrieved May 5, 2015. ↑ Bonnette, Michael, ed. (2014). 2014 LSU Football Media Guide (PDF). LSU Sports Information Office. pp. 16–18. Retrieved May 5, 2015. ↑ Campbell, Kyle; Jones, Joey, eds. (2014). "2014 Ole Miss Football Guide". University, MS: University of Mississippi Athletics Media Relations Office. p. 104. Retrieved May 5, 2015. ↑ Sutton, Brad; Hudson, Herman; Balside, Zach; et al., eds. (2014). 2014 SMU Football Media Guide. Southern Methodist University Department of Athletics. pp. 1, 80–82. Retrieved May 5, 2015. ↑ Cannon, Alan, ed. (2014). 2014 Texas A&M Football Media Guide (PDF). Texas A&M Athletic Media Relations Office. p. 150. Retrieved May 5, 2015. ↑ "National Championships". Auburn Tigers: The Official Website of Auburn Athletics. 2016. Retrieved November 13, 2016. ↑ "Feature Story: Chicago Football Eras". University of Chicago Campus and Student Life. October 8, 2012. Retrieved May 5, 2015. ↑ "Penn State official Athletic Site – Traditions: National Champions". Pennsylvania State University Department of Athletics. Retrieved May 5, 2015. ↑ Cohen, Mark (2014). 2014 TCU Football Fact Book. TCU Athletics Media Relations Office. pp. 2, 129. Retrieved May 5, 2015. ↑ "Stanford Football History". Stanford University Department of Athletics. Retrieved May 5, 2015. ↑ Young, Jim, ed. (2014). 2014 Stanford Football Media Guide (PDF). Stanford University Athletic Communications and Media Relations Department. pp. 172, 180. Retrieved May 5, 2015. ↑ Higbee, Zack; Satterfield, Derek, eds. (2014). University of Arkansas Razorbacks 2014 Football Media Guide. UA Media Relations Department. pp. 18, 140. Retrieved May 5, 2015. ↑ "Boston College Official Athletic Site: 1940 Football 'Team of Destiny' – National Champions". Boston College Athletics Department. Retrieved May 5, 2015. ↑ "1984 National Championship". BYUCougars.com: The Official Site of Brigham Young Athletics. 2011. Retrieved May 5, 2015. ↑ 25th Anniversary of the 1981 National Championship Team (PDF). Clemson University. 2006. Retrieved May 5, 2015. ↑ "Colorado Football 1990 National Champions". CUBuffs.com—Official Athletics Web site of the University of Colorado. Retrieved May 5, 2015. ↑ "A Championship Tradition". DartmouthSports.com—Official Web Site of Dartmouth Varsity Athletics. August 30, 2006. Retrieved May 5, 2015. ↑ "2015 Football Media Guide". University of Kentucky Athletics. p. 100. Retrieved August 14, 2015. ↑ "Terrapin Team Titles: University of Maryland National Championships". Maryland Athletics, University of Maryland. 2015. Retrieved May 5, 2015. ↑ 2014 Navy Football Media Guide (PDF). Naval Academy Athletic Association. 2014. pp. 8–9. Retrieved May 5, 2015. ↑ "AFCA Recognizes Oklahoma State as 1945 National Champion". OKState.com. Oklahoma State University Athletics. 13 October 2016. Retrieved 18 October 2016. ↑ Baum, Jason, ed. (2014). 2014 Rutgers Football Factbook. Rutgers University Office of Athletic Communications. p. 2. Retrieved May 5, 2015. ↑ Edson, Sue Cornelius, ed. (2014). 2014 Syracuse University Football Media Guide (PDF). Syracuse University Athletic Communications Department. pp. 6, 107. Retrieved May 5, 2015. ↑ 2014 UCLA Football Media Guide (PDF). UCLA Sports Information Office. 2014. pp. 90, 108. Retrieved May 5, 2015. ↑ "NCAA University of Southern California Public Infractions Report" (PDF). Indianapolis, IN: National Collegiate Athletic Association. June 10, 2010. p. 58. Retrieved May 5, 2015. ↑ "University of Georgia Championships". UGA Athletics, University of Georgia. 2015. Retrieved May 5, 2015. ↑ "Amway Coaches' Poll". American Football Coaches Association. Retrieved May 5, 2015. ↑ Associated Press (January 13, 2013). "FBS coaches' poll will continue every week despite BCS going away". Retrieved May 5, 2015. ↑ "BCS Group vacates USC 2004–05 national championship following NCAA denial of appeal" (Press release). Bowl Championship Series. June 6, 2011. Retrieved May 5, 2015.